FINDLAY, Ohio , February 08 /Businesswire/ - February 12 marks the 210th anniversary of Abraham Lincoln’s birth. America’s sixteenth president, Lincoln is memorialized on Mount Rushmore, Washington D.C.’s Lincoln Memorial and on the U.S. penny. While a penny may be worth one cent in currency, when it comes to tire safety the value of a penny can be much more. Cooper Tire’s Tread Wisely™ program, a tire and vehicle safety campaign for teens and young adults, teaches young drivers how to use a penny to help keep their tires in top shape and stay safer on the road. 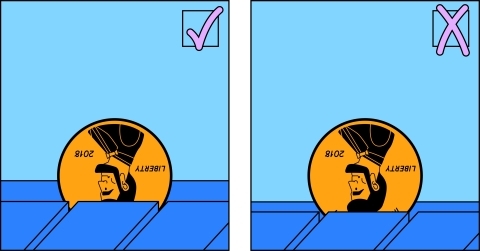 To check tread depth using the penny test, insert the edge of a penny into the most worn groove of the tire tread with Lincoln’s head down and facing you. If the top of Honest Abe’s head is covered by tread, meaning the top of his head cannot be seen, the tire tread is in good shape. If the top of his head is visible, the tire should be replaced. In addition to checking tire tread depth once a month, Cooper’s Tread Wisely program encourages young drivers to also complete monthly checks of their tire pressure and overall tire condition. “It’s the combination of these three important tire safety checks that ensure tires are in good condition and ready to perform as you expect them to. If you take care of your tires, they will take care of you,” Geaman added. Videos featuring former “The Bachelor” star and Cooper safety spokesman Arie Luyendyk, Jr. that show how to perform these three tire safety checks, as well as videos on other driving safety topics, are available on the free Tread Wisely mobile app or at treadwisely.org. The Tread Wisely app is available for download from the App Store (iOS) or Google Play Store (Android). Tread Wisely is a tire and vehicle safety program for young drivers sponsored by Cooper and designed to educate and motivate young people to take necessary precautions and important safety measures when it comes to their tires and driving. Cooper shares life-saving messages about tire safety through Tread Wisely social media channels, the web, special youth-directed safety events, and on the ground in communities across the globe. Hundreds of Cooper employees have signed up to serve year-round as Tread Wisely volunteers, demonstrating tire safety in schools, at sporting events, churches and other venues, reaching young drivers in the communities where they live and work. To learn more about Tread Wisely, visit www.treadwisely.org or follow @TreadWisely1 on Twitter, Instagram or Facebook.